YouTelo is an online telecom marketplace backed by an FCC licensed carrier. We provide an array of international telecom products, pinless calling , prepaid mobile Top-Up, and unlimited calling cards to various countries. We pride ourselves on offering these products and services at competitive pricing without sacrificing quality. YouTelo.com is special because it is the only online telecom center where you can find many products and services such as international calling service, international mobile phone recharge, domestic mobile phone recharge, and unlimited calling to certain destinations…all in one place! 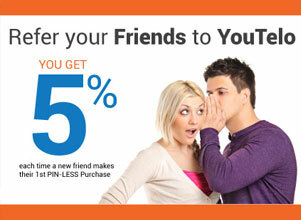 We also are a leader because we never add hidden fees or deduct minutes from your account for any reason. Your account does not expire like most phone cards out there. We firmly stand behind our products and services and provide the most trusted international calling marketplace on the web, offering the most innovative and dependable products available. Talk More, Spend Less...YouTelo! We take pride in offering you the most honest, innovative, and high quality international calling service available. Whether calling from a landline or mobile phone, YouTelo is committed to giving our customers the most value for their money when making international calls. We offer excellent 24/7 customer support, full account history including call detail reports, and an international network of premium routes which combine with our industry leading products to make YouTelo the smart choice for all of your international calling and mobile recharge needs. No connection fees. No maintenance fees. No sign-up fees. No surcharges. No obligations. No expiration dates. No rip-offs. No hassles!